MASN recently followed umpire James Hoye as he participated in an UMPS CARE charities event at Johns Hopkins Hospital in Baltimore, Maryland alongside The Oriole Bird mascot and crew-mates Jeff Kellogg and Will Little. Though broadcaster Paul Mancano's narration stated, "For once, James and his fellow umpires got to shed their stoic exteriors and act like kids again," bear in mind that UmpsCare regularly participates in a handful of charitable endeavors, including the Blue Crew Tickets, Blue For Kids, and All-Star Scholarship programs. Earlier this season, we followed the story of Tom Hallion's crew hosting young Phillies fans at Citizens Bank Park, supported by UMPS CARE Charities. 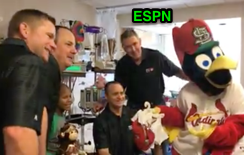 In July, ESPN Wednesday Night Baseball's Jon Sciambi visited with Mike Winters' informally named "M-Crew" (Mike Winters, Mark Wegner, Marty Foster, and Mike Muchlinski) in St. Louis while showing the umpires visit a local children's hospital as part of the Blue For Kids program.